If you're searching the web for the best grass seed to plant in your lawn you undoubtedly came across references to elite grass in lawn and gardening forums, marketing and even university turf trial documents. It seems like people are giving a lot of weight to this term and it almost seems as if you don't use elite seed while renovating your lawn your lawn won't be as nice, it will have tons of problems, your neighbors will hate you and your kids won't get into a good school. Might as well save money and just plant hay if you're not using elite grass seed. So let's go out and buy a bag of elite grass seed so we don't ruin little Johnny's future! But what makes one grass seed elite and another not elite? There's No Such Thing As Elite Grass! So you go to your local garden center and check all the bags and none of them contain the word "elite". After searching online you see that it's not a brand or a variety of grass and it seems like most people are special ordering it online from places like SeedSuperStore.com but you go there and there are no grass seeds labeled elite. Maybe you need to call someone and give them a special codeword so they know you're cool and let you in on the good stuff? The truth is there is no such thing as elite grass. At least not in any official capacity anyway and even unofficially it's somewhat meaningless. There is no particular grass variety, cultivar or official designation or even official criteria for grass which allows one grass to be considered elite and another not. It's not even that descriptive like "delicious" that one might use for food. Even though taste is subjective it does give you some idea about what quality is being described whereas elite tells you nothing. Does that particular grass cultivar have exceptional disease resistance? Does it have a very dark color? Does it have great texture? It could be called elite if any of those are true even if those characteristics only appear under specific conditions. 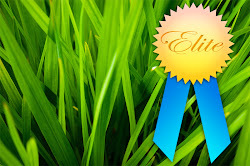 I have a little bit of a problem whith grass being referred to as elite because it's usually used along with other data that is a little more concrete and it makes the elite designation sound more official than it is. There are some more concrete descriptions of seeds. The Association of Official Seed Certifying Agencies, through it's member agencies, certifies seed that are offered for sale. Part of what the AOSCA does is establish standards for genetic purity and quality for certified seed. There are 4 classes of seed including Breeder seed, Foundation seed, Registered seed and Certified seed which have higher standers for breeder seed and less for certified seed. Federal and state laws require seeds to be properly labelled. There may be some differences between states but for the most part a label will indicate the percentage of each variety, other crop seed, weed seeds, inert material and noxious weed seeds need to be identified as well as results of a germination test, the date tested and lot number. In NJ seed testing is performed by The NJ Department of Agriculture Division of Seed Certification and Control which is an AOSCA member agency. If you want to sell seed in NJ, including grass seed, you need to be registered as well as have your seed tested. AOSCA member agencies also do spot checks of seeds on the shelves of retailers. This is a good idea because seed growers/distributors are only required to send in a small sample of seed to have a lot tested so what's stopping them from screening the seed before sending it or even sending a completely different lot? The University of Kentucky recently published their 2007-2011 Seed Inspection Report that provides information about how many tests were conducted in Kentucky as well as how many inspections revealed seed bags were mislabeled either due to purity, germination or sometimes noxious weeds. It's shocking to see some of the bigger names in consumer grass seed having high mislabeled rates (20%+) and interesting that Vigoro had no mislabeling issues. Don't know if that makes their seed good (haven't checked) but at least you know what you're getting. Sod Quality seed is a certification given to seeds that are tested to a higher standard than other consumer seeds. A much larger sample is submitted for testing than is used for other seeds. This is also performed by AOSCA member agencies but I do not believe all states offer Sod Quality Certification. New York does but New Jersey doesn't seem to. University researches and independent companies conduct turf trials to evaluate the performance of grass varieties. Many of the university turf trials are done in association with NTEP. Plots of grass are grown, compared and evaluated for various criteria including color, texture, spring green up, drought tolerance, disease resistance, etc. Because some grasses might do well in some climates but not others, some soils and not others, it's best to find what works well in your area and see if the soil conditions match up. For example, Rutgers has at least two test sites in NJ and even though they're not too far away from each other grass in general is ranked higher at one site than the other. Check the back of the bag for the label, search the web for data related to the grass varieties listed and see what does good near you. You're not really going to know exactly how well it does for your conditions until you plant it yourself. Each year grass breeders come up with better varieties of grass so any decent grass seed you plant will look better than what you likely have. If you don't properly maintain your soil and lawn, most grass will look like crap. Elite is a commonly used term when referring to grass seed but it doesn't really mean anything consistent and you shouldn't put much weight to it. If you're particular about the seed you put in your lawn look into how well the seed performs in your climate and conditions. Find lawns you like in your area and ask them what they used. Plant samples and see if you like them. Seeds might look great in a university turf trial but look horrible in your lawn. Look at pictures and reviews online for comparison. You're not growing data, you're growing grass.